(Photo: http://www.manchester.anglican.org/serving-communities)UK aid worker before his beheading by the group that calls itself the Islamic State. 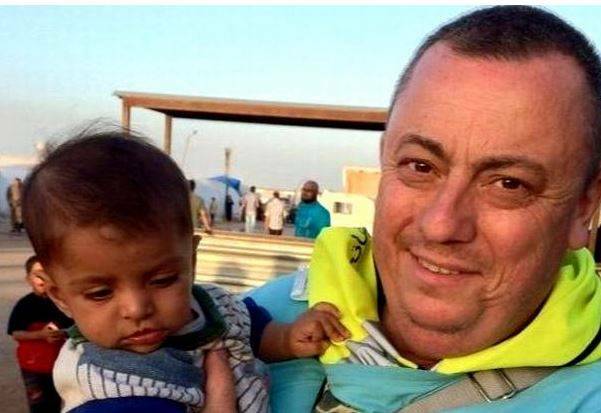 Muslim leaders in Britain and across the world have condemned as "despicable" the brutal beheading of aid worker Alan Henning, a taxi driver from the northern England city of Salford. One hundred prominent Muslim leaders were among those across the world who had appealed for the release of Henning by the group that calls itself Islamic State or ISIS. Ekklesia, a British Christian think tank reported . A video was released which showed his beheading by the renegade group in Syria. Henning's grieving was joned by hundreds of mourners, including leaders of the Muslim community, at a service of on October 4. The taxi driver's wife Barbara, and two children Lucy, 17, and Adam, 15, were embraced in emotional scenes at St Mary's Church in Eccles, Manchester, the Daily Mail reported. The United Nations Security Council strongly condemned the killing of British humanitarian aid worker Alan Henning on October 4 as "heinous and cowardly." The Secretary General of the Muslim Council of Britain, Shuja Shafi, declared, "This reported murder is a despicable and offensive act, coming as it does on the eve of the Muslim festival of Eid Al-Adha. "It is quite clear that the murderers of Alan Henning have no regard for Islam, or for the Muslims around the world who pleaded for his life. "Alan was a friend of Muslims, and he will be mourned by Muslims. "In this period of Hajj and this festival of Eid, Muslims remember the mercy of God and the emphasis God places on human life. "Alan Henning's murderers have clearly gone against that spirit of Islam. Our thoughts and prayers go out to his family." Mohammed Shafiq, chief executive of the Ramadhan Foundation, called Henning "a hero" and added that the "barbaric killing is an attack against all decent people around the world". Earlier Henning's distraught wife, Barbara, made a desperate plea to IS/ISIS to release him after he was shown in a video. She said: "Some say wrong time, wrong place. Alan was volunteering with his Muslim friends to help the people of Syria. He was in the right place doing the right thing." Ekklesia commentator Harry Hagopian, wrote on October 5, "The key challenge facing us all today is to resist our testosterone-driven instincts of bombing empty buildings and in so doing feel vindicated that we are physically acting against an evil ogre. "Rather, it requires winning the ideological battle of minds (before hearts) against such thugs. "This could happen if we discredit their methods and – here comes the crunch – challenge their backers," said Hagopian, an international lawyer, ecumenist and EU political consultant. "After all, a lot of ink has been spilt on whether the Gulf States are subsidising ISIL or other jihadist radical movements such as Jabhat Al-Nusra. "While that might well be untrue directly, do we not have the means to ensure that some of those countries proscribe their own wealthy citizens from bankrolling such terror movements, too?"